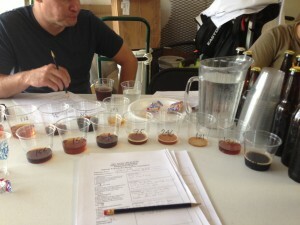 A flight of beers I judged at The Inquisition. The category was strong beers. A few weeks ago, I judged at the Austin ZEALOTS Inquisition, the homebrew contest of my homebrewing club (The Austin ZEALOTS). This was the 10th annual Inquisition and it went off without a hitch, primarily thanks to Corey Martin — our club’s Primary Fermenter, and guy who somehow got stuck running the contest — and Chris Rauschuber and his wife Whitney Roberts, who hosted the judging at their house. The Inquisition is the only annual homebrew contest that does not use the BCJP system of beer categories or judging sheets. The Inquisition has 10 fairly broad categories — malty, hoppy, dark, strong, yeasty, lagers, flavored beers, meads and ciders and an open category. Beers are judged on their overall quality, not the extent to which they mimic an existing beer style. We also have a special 11th category each year, called the Crusade., that changes each year. Past Crusades have included “The Napolean Complex” — a small beer that acts big. This year it was big, dark, Belgian beers. The ZEALOT picnic along the Colorado River in Emma Long City Park. The results of the Inquisition are announced at the ZEALOTS annual picnic, which for the past few years has been held at Emma Long City Park. The picnic usually has a pig roast, overseen by Roger Kovalcheck, but this year the area is in extreme drought and there was a burn ban in the park. There was still enough water in the Colorado River to provide wading for the sweltering homebrew club members. We even had two kegs floating in inner tubes so you didn’t need to get out of the water for a beer. 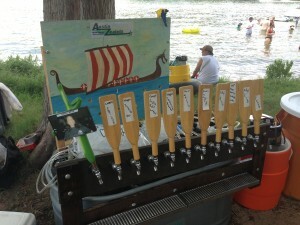 If you did get out of the water, you have over 25 kegs of homebrew to choose from. In place of usual rib cook off, there was a “chicken off,” open to chicken prepared in any manner. 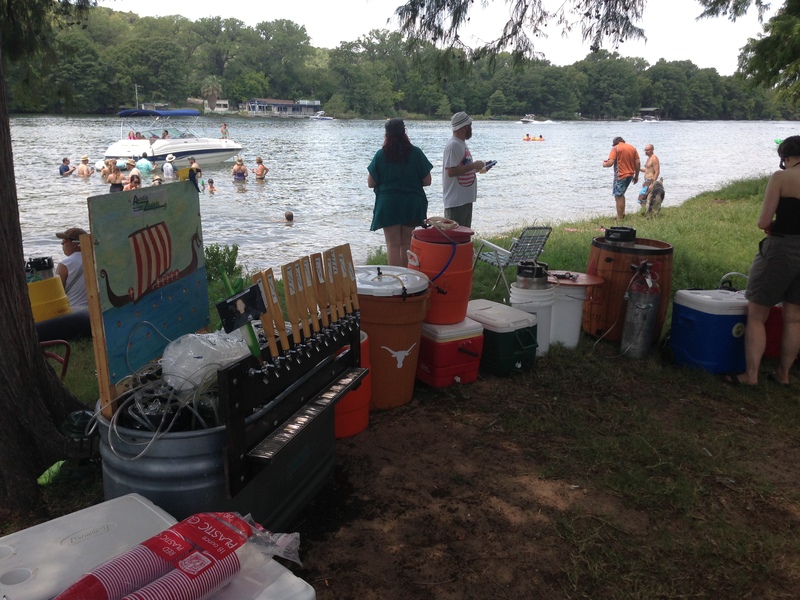 A lineup of homebrews, chilled in a livestock watering trough, at the ZEALOTS picnic. You know, I hear the Inquisition goes to 11. And that the contest is certified by no one! How can that be??? On a serious note I met some great homebrewers in North Carolina last year (the Iredell Brewers) and they patterned themselves after the ZEALOTS because of the apparent fun and lack of organization. Brilliant plan, I say.